Dr. Abdus Salam was one of the great physicists of the twentieth century. He made fundamental and far-reaching contributions to theoretical physics.In the previous century, James Clerk Maxwell brought about the first great unification in physics when he showed that the electric and magnetic forces are manifestations of a single force – the electromagnetic force, responsible for light. In 1968 Salam, Weinberg, and Glashow independently produced a second great unification, uniting the electromagnetic force with the weak nuclear force to produce the electroweak force. Dr. Abdus Salam was a dedicated educationalist and a noble soul who served his country with an earnest zeal, promoting the education science and training a large number of first rank physicists. Abdus Salam was born in Jhang, a small town in what is now Pakistan, on January 29, 1926. His father was Chaudhry Muhammad Hussain, an education official in the Department of Education in a poor farming district, and his mother was Hajira Nabi Baksh. Abdus was the eldest of their eight children. His family has a long tradition of piety and learning. In the same year (1946) he was awarded a three year scholarship to study for a Bachelor’s degree at St. John’s College, Cambridge, UK,. In 1949, after two years he graduated with first class honors in Mathematics. A year later, he graduated with first class honors in Physics. In 1951, age 25, Salam returned to the city of Lahore, in now independent Pakistan, to teach Mathematics at Government College, Lahore. He was filled with hope that he could inspire a new generation of young people to become scientists and modernize society. The following year(1952), he was appointed Head of Mathematics at Punjab University. He had come back with the intention of founding a school of research, but it soon became clear that this was impossible. To pursue a career of research in theoretical physics he had no alternative at that time but to leave his own country and work abroad. This was motivated by another important event that took place in 1953, Lahore suffered riots in which a very large number of Ahmadis were murdered. Ahmadis consider themselves to be Muslim, but are seen as heretics by many other Muslims. Salam, who was an Ahmadi, decided to leave Pakistan and return to Cambridge. Many years later he succeeded in finding a way to solve the heartbreaking dilemma faced by many young and gifted theoretical physicists from developing countries. At the ICTP (International Center for Theoretical Physics), Trieste, Italy, which he created, he instituted the famous “Associateships” which allowed deserving young physicists to spend their vacations there in an invigorating atmosphere, in close touch with their peers in research and with the leaders in their own field, losing their sense of isolation and returning to their own country for nine months of the academic year refreshed and recharged. In 1954 Salam left his native country for a lectureship at Cambridge, and since then has visited Pakistan as adviser on science policy. His work for Pakistan has, however, been far-reaching and influential. He was a member of the Pakistan Atomic Energy Commission, a member of the Scientific Commission of Pakistan and was Chief Scientific Adviser to the President from 1961 to 1974. For more than forty years he has been a prolific researcher in theoretical elementary particle physics. He has either pioneered or been associated with all the important developments in this field, maintaining a constant and fertile flow of brilliant ideas. For thirty years he has used his academic reputation to add weight to his active and influential participation in international scientific affairs. He has served on a number of United Nations committees concerned with the advancement of science and technology in developing countries. To accommodate the astonishing volume of activity that he undertakes, Professor Salam cuts out such inessentials as holidays, parties and entertainments. Faced with such an example, the staff of the Centre find it very difficult to complain that they are overworked. In the previous century, James Clerk Maxwell brought about the first great unification in physics when he showed that the electric and magnetic forces are manifestations of a single force – the electromagnetic force, responsible for light. In 1968 Salam, Weinberg, and Glashow independently produced a second great unification, uniting the electromagnetic force with the weak nuclear force to produce the electroweak force. At a physics conference in Seattle in 1956, Salam became very excited listening to Chen-Ning Yang, describe parity violation – Yang and his colleague Tsung-Dao Lee would be awarded the 1957 Nobel Prize in Physics for this work. Yang described how parity, a property which physicists believed was always conserved – like energy, momentum, and electric charge – need not be conserved in weak nuclear interactions, such as beta decay. The implication was that Nature could tell the difference between left and right. Why, Salam wondered, was left-right symmetry violated in weak interactions, but conserved in electromagnetic interactions? He convinced himself, correctly, that the answer lay in a gauge theory – the first of which had been Maxwell’s formulation of electrodynamics. Salam worked on the problem with his PhD student Ronald Shaw and, in 196l-62, Steven Weinberg spent a year with Salam at Imperial College. The scientists produced a theory saying that while the electromagnetic force was transmitted by massless photons, there must exist particles with mass involved in a unified force – the electroweak force. They theorized the existence of W and Z bosons. W and Z bosons, they said, are the particles with mass that take part in beta decay of an atomic nucleus. The net outcome of beta decay is that a neutron turns into a beta particle (a high energy electron), a proton, and an electron antineutrino. The W boson is an intermediate particle in beta decay. The neutron first decays into a W boson. In the case of beta decay, the W boson is negatively charged, written W–. It hangs around for an incredibly short amount of time: 3 × 10-25 seconds, before decaying into a proton, beta particle, and antineutrino. Z bosons carry no electric charge, but carry momentum. They are observed in very high energy situations. The fact that the force carriers of the electroweak force – the W and Z bosons – have mass while photons have no mass was a major problem, because in an SU(2) gauge theory (particle physics jargon for the gauge framework Salam and others were working within) bosons must have no mass. Z boson interactions, called weak neutral currents, because Z bosons carry no charge, were observed at CERN in 1973. W bosons were observed in 1983. Taken together, the SU(2) gauge theory of the weak interaction, plus the electromagnetic interaction, plus the Higgs mechanism produces the Glashow-Weinberg-Salam model, finalized in 1968. The model successfully unified the electromagnetic and weak forces into the electroweak force. In 1974, Salam was saddened when Pakistan’s government passed a law declaring Ahmadis to be non-Muslims. In 1980, after he received the Nobel Prize, he was invited as an honored guest to the Quaid-e-Azam University in Pakistan’s capital city, Islamabad. The ceremony was cancelled because extremists threatened to break Salam’s legs if he turned up at the university. In the mid-1980s, Salam began suffering from a degenerative neurological disorder. Eventually he was confined to a wheelchair. He retired from his chair at Imperial College in 1994, age 68. 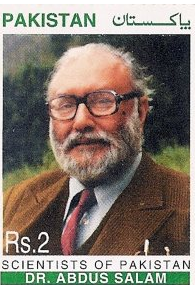 Abdus Salam died peacefully, age 70, at home in Oxford on November 21, 1996. He was buried four days later in the Ahmadi city of Rabwah, Pakistan. During the early 1960s, Salam played significant roles in establishing the Pakistan Atomic Energy Commission (PAEC) and Pakistan’s Space and Upper Atmosphere Research Commission (SUPARCO). Salam was passionate about promoting science in developing countries. He recalled there had once been a golden age of Islamic science, when for hundreds of years Islamic scientists had led the world. He urged Muslims to regain the spirit of free enquiry that existed in those times. Salam was the founder of the Third World Academy of Sciences (TWAS) and the International Centre for Theoretical Physics (ICTP). In 1979, Salam was awarded the 1979 Nobel Prize in Physics, along with Glashow and Weinberg, For their contributions to the theory of the unified weak and electromagnetic interaction between elementary particles, including, inter alia, the prediction of the weak neutral current. Salam received high civil and science awards from all over the world. Salam is recipient of first high civil awards – Star of Pakistan (1959) and the Nishan-e-Imtiaz (1979) – awarded both by President of Pakistan for his outstanding services to Pakistan. The National Center for Physics (NCP) contains a Abdus Salam Museum dedicated to the life of Salam and his work as he discovered and formulated the Electroweak Theory. Below is the list of awards that were conferred to Salam in his lifetime.